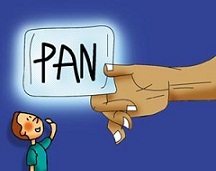 PAN card can be applied by using form 49A or 49AA. You can download these forms online or can be prepared on your own. If you are applying through a TIN FC then such forms are also available there. Now the biggest question that is asked by a common man is which form I should use for applying a PAN. Individuals who are citizens of India are required to apply in form no 49A. Even a HUF, Indian Companies registered in India, AOP, FIRMS and Local authorities are required to apply in form 49A. In case of Individuals who are not Indian citizen or companies, firms, LLP not registered in India are required to fill up form 49AA for applying a PAN. Along with form 49A or 49AA, the applicant needs to provide other documents such as identity proof, address proof and two photographs. In case of companies, firm, LLP and AOP photographs are not required. Such companies and firms are required to provide their proof of incorporation or deed respectively as identity and address proof along with the forms for PAN application. In case you do not have a PAN and you are required to open up a bank account or wants to do any financial transactions then instead of waiting for a pan card you can fill up Form 60/61. If you want to make correction to your PAN card details such as applicants name, fathers name, date of birth, address, photograph and any other details then you need to fill up a correction form and such forms has to be submitted along with two passport size photo graph, proof of identity, proof of address and proof of issuance of PAN. If you are applying for change in name which has been changed due to your marriage or some other reason, then in addition to other details you also required to provide proof of change of name for issuance of PAN with your new/changed name.